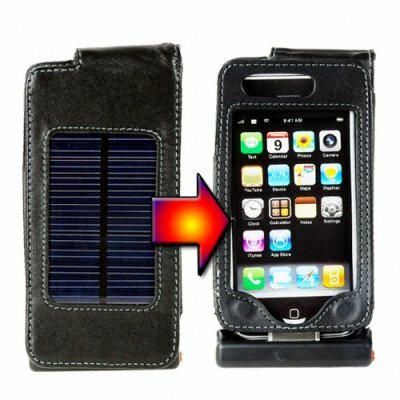 Successfully Added iPhone Solar Power Battery Case - Green Powered Protection to your Shopping Cart. iPhone 1st generation, 3rd generation and iPod Touch case with a high capacity battery built in that can charged either with AC power or with environmentally friendly solar power. Completely forget your battery woes with this high quality and stylish sheepskin protection case. One full charge of the battery will give you enough power to completely recharge the iPhone's battery. Power can be supplied even while your Apple gadget is in use, and on a sunny day, just attach the case to your belt buckle and power will constantly be trickling in. In the ideal world, Apple will let you open the iPhone open to replace the battery yourself when it is low, but till then get all your power needs with this green powered, highly sought after iPhone and iTouch accessory.